We have discussed heat transfer in past issues of the ARC newsletter. It comes up again this week because we have been testing forced air stoves. 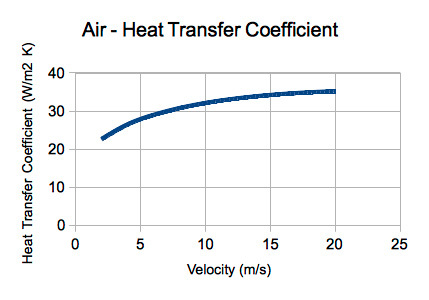 Does the increased air flow raise the thermal efficiency? We estimate that the air flow is around 3-4 meters per second in the new Department of Energy funded side-feed fan stove that is about to go into field testing. We tested the stove this morning and we got 49.1 % thermal efficiency using Douglas fir sticks and a 9 liter pot with an 8mm channel gap between the skirt and the pot. We haven’t had much success measuring velocity in cooking stoves. After reading Thomas Castillo’s Master’s thesis on the subject (2011, Ohio State University) I understand why! Using a pitot tube, he found different velocities almost everywhere in the stove and skirt. Thomas looked at the Open Fire, the Rocket stove, and the WoodGas stove and, as far as I could determine after a quick read, found velocities generally lower than two meters per second in the three stoves with substantial variations depending on the placement of the measuring device.